There are lots of places online to find wood router reviews. Retailer websites, woodworking magazines, and hobby sites all have lots of owner ratings for various models and brands. In fact, there are so many places to get information that sometimes it is hard to sort through them all. Unfortunately, some of the resources out there can give you flawed ideas about a particular router. Too often, the retailer websites become a place where a relatively small number of unhappy consumers vent about their bad experience, while the thousands of people who are perfectly happy with a product don't take the time to post reviews. Magazine articles can be biased by advertiser dollars, and often can't give you any information about how well a tool holds up in the long run. A magazine review is also based on one sample of a particular model, and can't tell you how reliable a model is overall. Some of the best information is found on the various woodworking forums. On the forums, people discuss, compare notes, and relate their personal experiences with the tools over the long haul. Most of the forum comments are from people that are woodworking enthusiasts, and many have experience with other similar models and different brands. Overall, the average level of expertise on the forums is higher than what you find in the wood router reviews on Amazon and some of the other retail websites. The "level of expertise" can count for a lot - I can't count the number of times I have seen a poor review posted by someone who obviously was using the wrong tool for the job, or had a failure due to misuse. Back to the forums - The biggest disadvantage to looking for wood router reviews on the forums is that it can be very time consuming to find the information you are looking for. When you search for a particular model, the results you get will often have a single comment buried on page four, and you have to skim through multiple pages just to find it. I believe the best approach to researching a new tool purchase is to look at all of the above. None of the resources out there can give you the entire picture, and each of the resources above has something to offer that the others can't. What I have done here is to gather the woodworking router reviews from various sources online and in print, and compile summaries of what I found. In many cases, I have included quotes from actual owners on some of the most popular woodworking forums. I have also read through thousands of reviews on Amazon to look for common issues and reliability problems in a particular model. Bosch Colt: Bosch tools in general get good ratings, and their palm router is no exception. There are two basic models. The PR10E has a 1.0 HP single speed motor and is only available with a fixed base. The PR20EVSK also has a 1.0 HP motor, but the speed is variable from 16,000 to 35,000 RPM. The PR20EVSK comes with a fixed base only. The PR20EVSNK comes with angled and offset bases, and the PR20EVSPK comes with an additional plunge base. 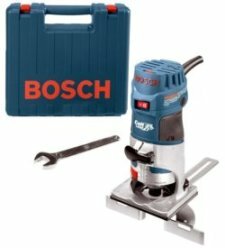 The Bosch wood router reviews are overall very good, as they are for most Bosch tools. 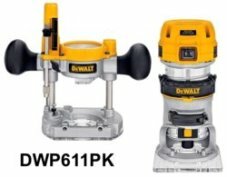 The PR20EVSK has won a number of different magazine comparison tests in the past, but more recently it seems to have been edged out by the Dewalt trim router. Dewalt Routers: Dewalt offers fifteen different woodworking routers at the moment, but they are all variations of five basic designs with different accessories and bases. They range from 1-1/4 HP on the compact routers up to 3 HP on their biggest router. The Dewalt wood router reviews are also very good overall, and a couple of them have come out on top in magazine comparison tests. The Dewalt DWP611PK compact router in particular has done really well in the magazine tests, and gets very good ratings at the retailer websites. With a couple of exceptions (noted in my review), Dewalt routers are very reliable, professional quality tools. Hitachi Routers: Overall, the Hitachi wood router reviews are good, but not quite up to par with some of the models from other manufacturers. However, they tend to cost less than similar models in other brands, too. A couple of the Hitachi routers have won "Best Value" awards in magazine comparison tests. There are five models in total at the time of this writing, with 2-1/4 HP or 3-1/4 HP ratings. The entry-level M12VC is very popular for use in CNC machines. 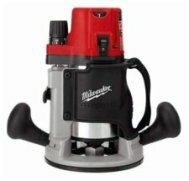 Milwaukee Routers (Fixed Base): Milwaukee has a number of options, ranging from 1-3/4 HP to 3-1/2 HP. The Milwaukee wood router reviews are good to excellent, depending on the particular model. The favorite feature on several models is the "Body Grip" design, which enables you to hold the router by gripping it around the body, or by using the traditional side handles. Milwaukee Routers (Combo Kits): Milwaukee offers two router kits that come with both fixed and plunge bases, with either 1-3/4 HP or 2-1/4 HP ratings. The fixed bases in the kits have the popular "Body Grip" design. Ratings are very good - believe it or not, the most common complaint is that the case that the kit comes in is too big! Ryobi Routers: Ryobi makes entry-level, homeowner grade tools, but that isn't necessarily a bad thing! If you only occasionally need a woodworking router, a Ryobi may give you the best bang for your buck. They offer a fixed base model, a plunge base model, and a cordless trim router. The Ryobi router reviews are fairly good but not great, which is to be expected at their price point. It is really hard to beat the price, and I doubt you could find a better one for the same amount of money. I have also read through thousands of reviews on Amazon to look for common issues and reliability problems in a particular model. Click on the links above to be taken to the individual wood router review pages for a more in-depth look and more details about the models available from each manufacturer. I will be adding more wood router reviews as time allows, so check back before you buy your next router!